Julie Brahmer, M.D., is an active clinical leader in the treatment of lung cancer and mesothelioma. 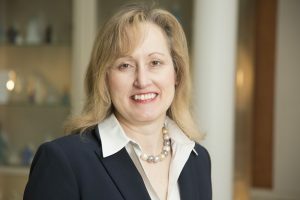 As the director of the Thoracic Oncology Program and professor of oncology at the Sidney Kimmel Comprehensive Cancer Center at Johns Hopkins, her research and clinical practice focuses on the development of new therapies for the treatment and prevention of lung cancer and mesothelioma. She sat down with OncLive to talk about the benefit of immunotherapy in the treatment of patients with metastatic non–small cell lung cancer (NSCLC). Brahmer explained patients who do well on immunotherapy in the months to years after receiving it will do tend to do better overall. Brahmer's research interests include leading early phase immunotherapy trials of anti-PD-1 antibodies, international phase III studies of immunotherapies in lung cancer and investigator-initiated trials evaluating epigenetic therapies in combination with immunotherapies.